With a huge recent worldwide interest in sustainable living we have seen the establishment of Irelands first eco village in Cloughjordan, Co. Tipperary. With so many natural resources becoming depleted the need to conserve and use them more wisely is a must. When communities work together this goal of sustainable living is more achievable. The site was purchased in 2005 but planning took place long before this when sustainable projects Ireland was launched in 1999. The members within the community share the right and responsibility to make the project successful. 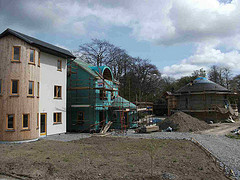 The houses are low energy and very efficient with regards to heating and cooling with huge emphasis put on insulation. The whole community also shares power gained from a wood and solar powered systems. Last year I visited the site and was very impressed by the design of the houses and the layout of the site. Farming plots are allocated to all residents to encourage the growing of food which strengthens the villages tie to sustainability. Education workshops take place to further residents knowledge on how they can live more sustainably and I was lucky enough to attend one. The opening of an eco-hostel in 2011 also helped raise awareness and promote sustainable living to visitors. I believe, from looking at this example, that working together at community level is a more efficient way of working towards a sustainable world.